Not one, but two Castellans to face. This was possibly the worst match up for my army. I perhaps had the firepower to deal with one Knight, but three would be a very tough prospect. The end of game objectives would not help either, as I doubt I would have much left to grab them at the end of the game. I think this one was a forgone conclusion from the start, but I would play it out to see what happened. Looking at the battlefield, there were two large line of sight blocking buildings that could be of use. If I could go first with placing the objectives, I could place them on top of the buildings, blocking the Knights from getting to them. This could give me a chance if I could hide my units long enough to make the end of the game, then grab the objectives. I then promptly lost the roll off for deploying the objectives and choosing the deployment zones, so that put paid to that plan! We then deployed our forces. 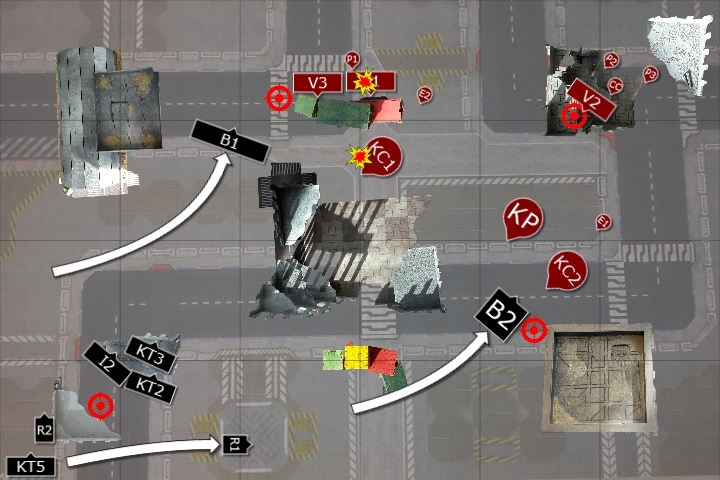 I put the three units of Bikers across my deployment zone. I then hid all that I could in the ruins at the back of my deployment zone, trying to hide a number of units and my vehicles behind the small ruins. I spread the Teleport Homers out across the deployment zone. Adam placed a Castellan and the Paladin on his left flank, with the other Castellan on the right. 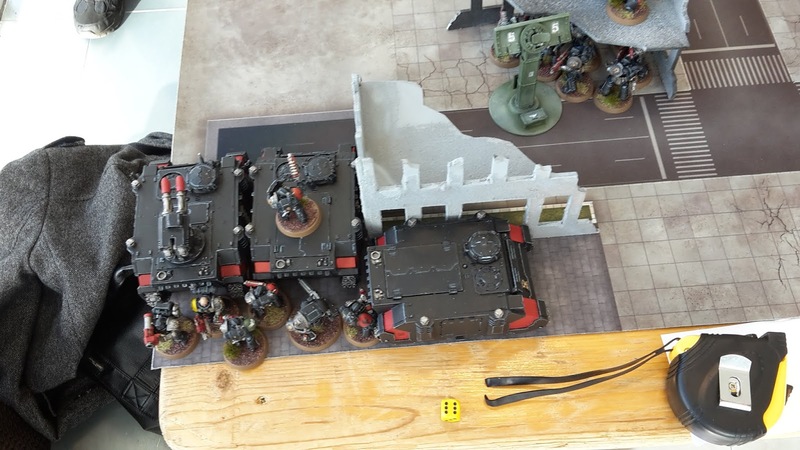 One unit of Vanguard held the back ruins, supported by two of the Psykers and the Company Commander. 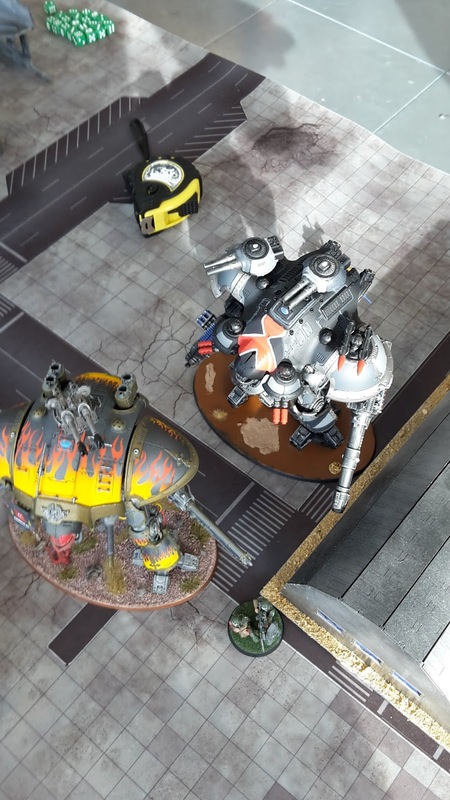 The other two units of Vanguard went on the right flank, with a Psyker and Enginseer. If I could get the first turn, I could advance the Bikers to pen in the Knights and stop them moving far for at least one turn. 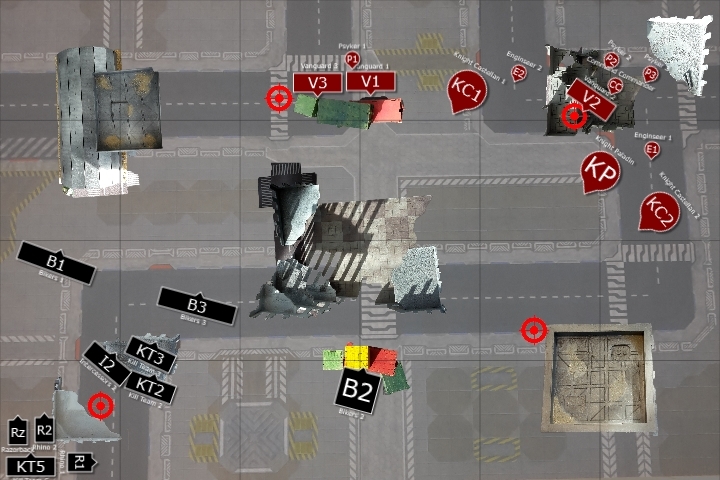 This might give me some breathing space to stop them from getting too far into my deployment zone later in the game. 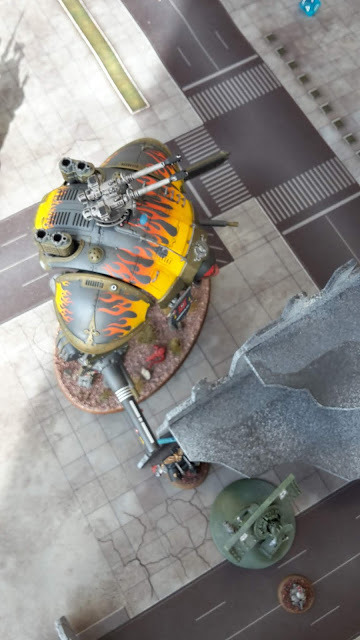 I could also use the firepower of the Bikers against the Vanguard to hopefully get first strike. 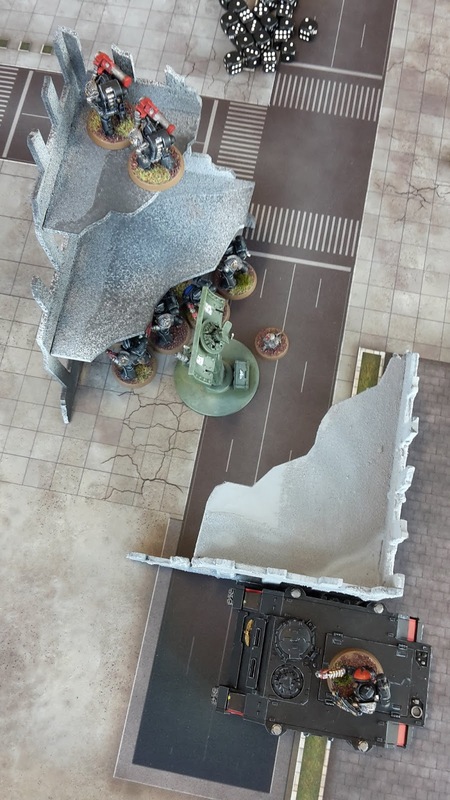 There was little place to hide the Bikers from the Knights, and very little tall enough terrain to block their line of sight, so had to deploy them in the open. I lost the roll off for first turn, and failed to seize the initiative. This was going to hurt! There was litle point using the Prepared Positions stratagem. The Castellan's weapons had a high enough AP that it would make little difference against my vehicles. 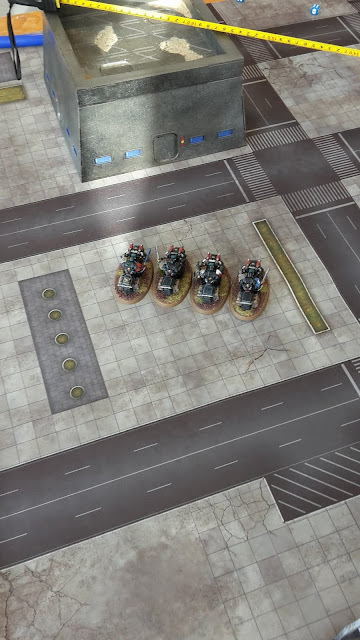 The Imperial Knights moved up on the Deathwatch lines, supported by the Enginseers (to heal them in case I actually managed to do some damage). 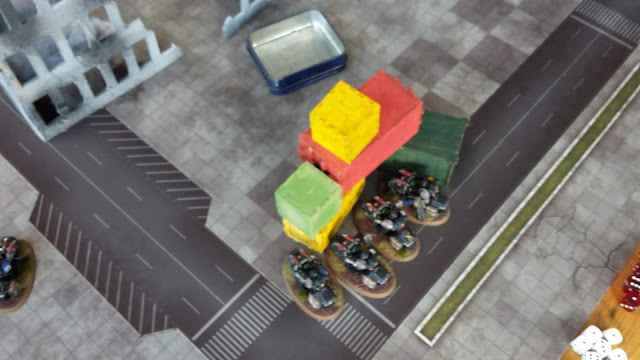 In the shooting phase, the first Castellan opened fire on the Rhino, Bikers and Missile Launcher Kill Team. 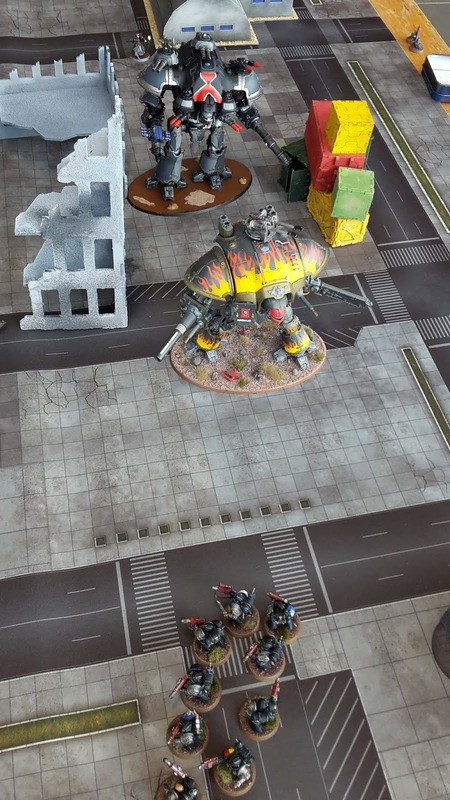 The firepower killed one Veteran and one Terminator. The Volcano Cannon hit the Rhino, but failed to wound. Cawl's Wrath wiped out the Biker unit for First Strike. 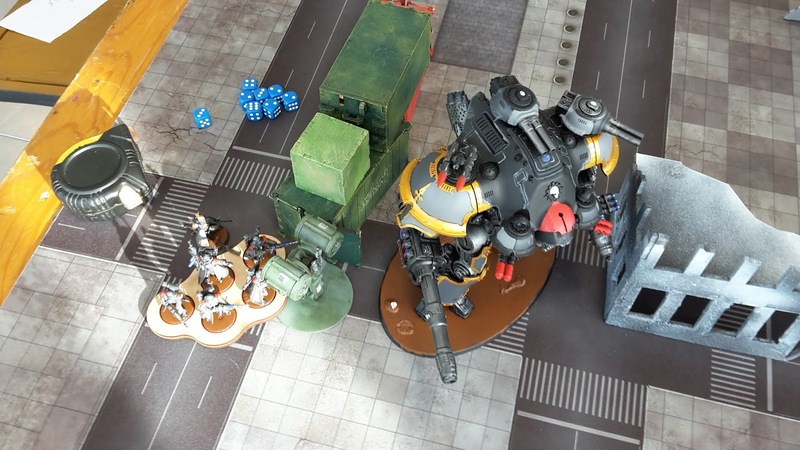 The Knight Paladin fired at the Missile Launcher Kill Team and Rhino, putting two wounds on the Rhino and killing one Veteran. 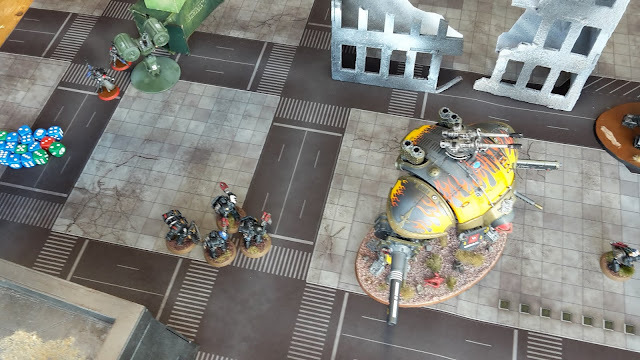 The second Castellan fired at the Deathwatch, destroying the Razorback (after using a CP re-roll to get 6 shots with the Volcano Cannon) and killing one more Veteran. 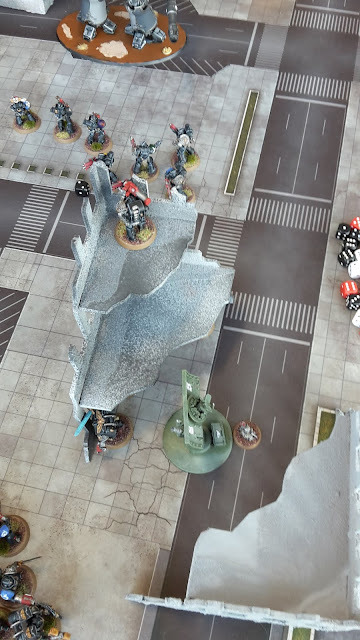 The Plasma Decimator did two wounds on the Bikers, but my Storm Shield managed to block both shots. At the end of his turn, Adam scored First Strike. 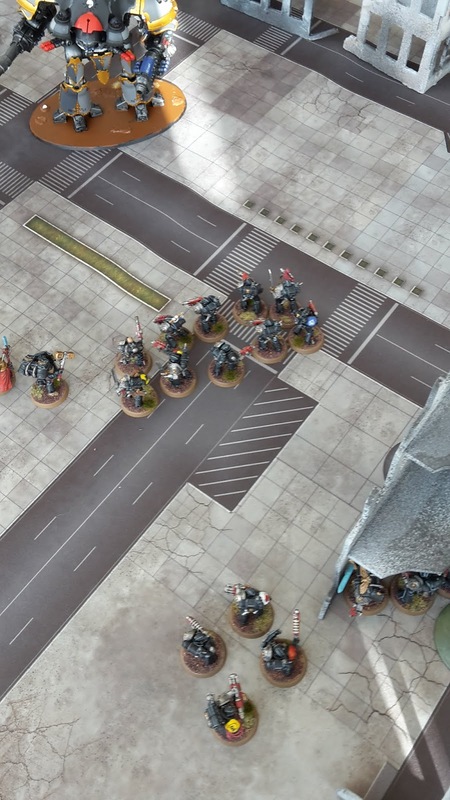 On the left flank, one unit of Bikers moved up on the Skitarri Vanguard. The other unit of Bikers moved up to block the path of the approaching Knights. In the shooting phase, the Bikers on the left fired at the Vangaurd, wiping out the unit. 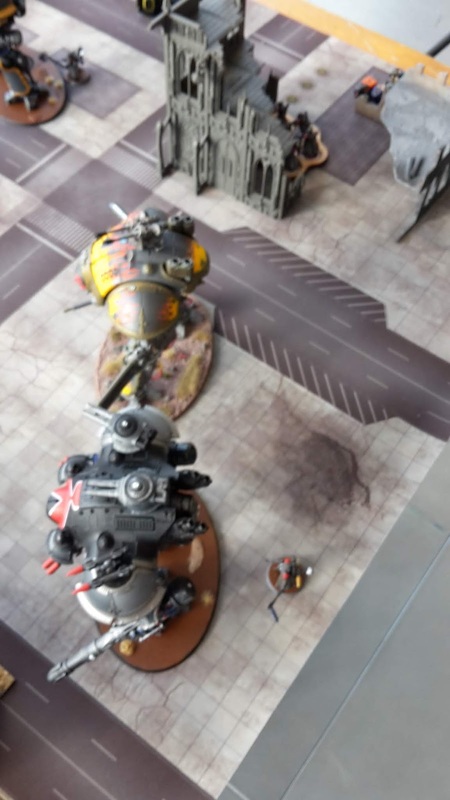 The Veterans fired two Missiles at the Castellan on the left, doing one wound, but it bounced off the invulnerable save of the mighty war machine. In the charge phase, the Bikers attempted an 11" charge on the second unit of Vanguard, but failed to make the distance. At the end of my (very quick!) turn, I scored First Strike. On the right flank, the Castellan moved up on the Bikers, while the two other Knights moved up on a second unit of Bikers. 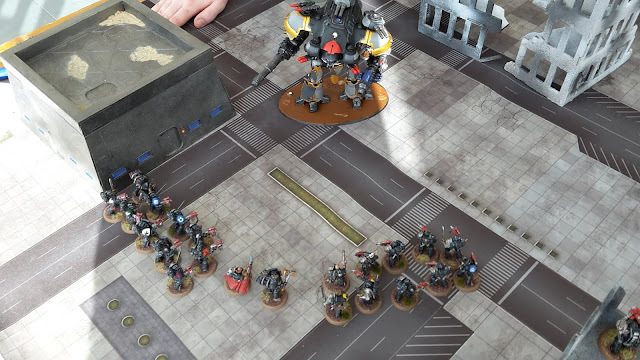 In the psychic phase, the Primaris Psyker failed to cast Smite on the Bikers. 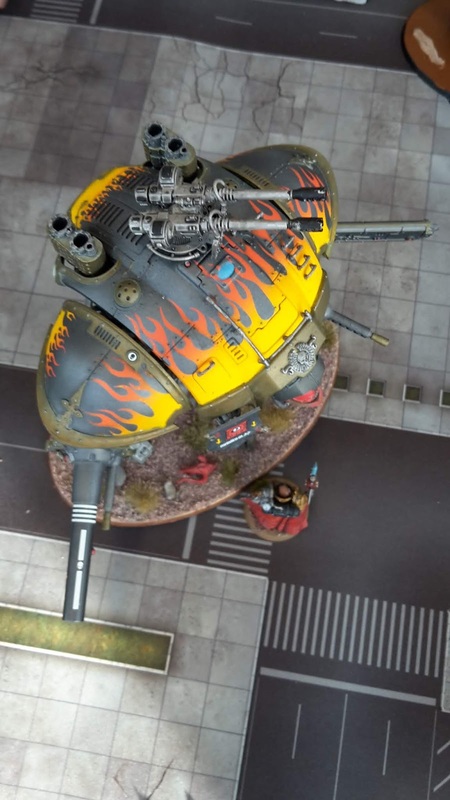 In the shooting phase, the Knight Paladin fired at the Rhino, getting 12 shots with the Battle Cannon. 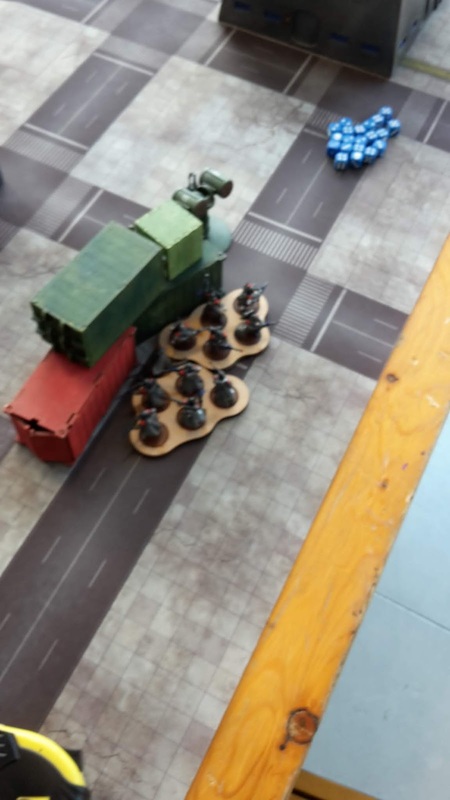 The Smoke Launchers meant only four hit, taking 6 wounds from the vehicle. The Heavy Stubber did 3 wounds on the Missile Launcher Kill Team, but they were all saved. 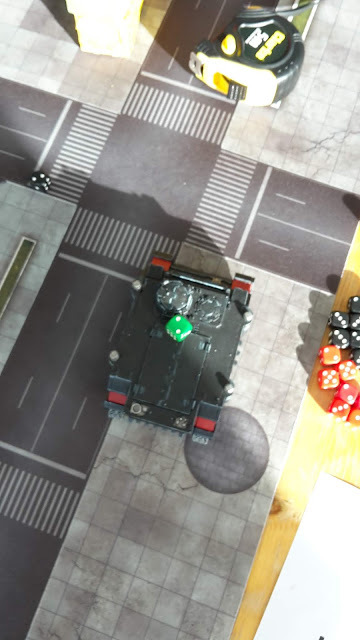 The Castellan fired at the Rhino and Heavy Bolter Kill Team, destroying the vehicle and killing three of the team. 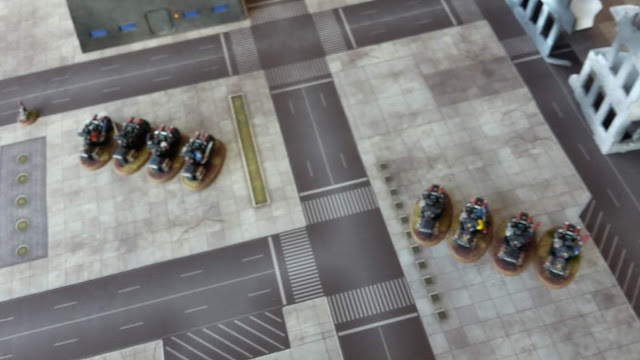 The rest of its firepower killed the Deathwatch Bikers. The second Castellan fired at the other unit of Bikers, killing them. 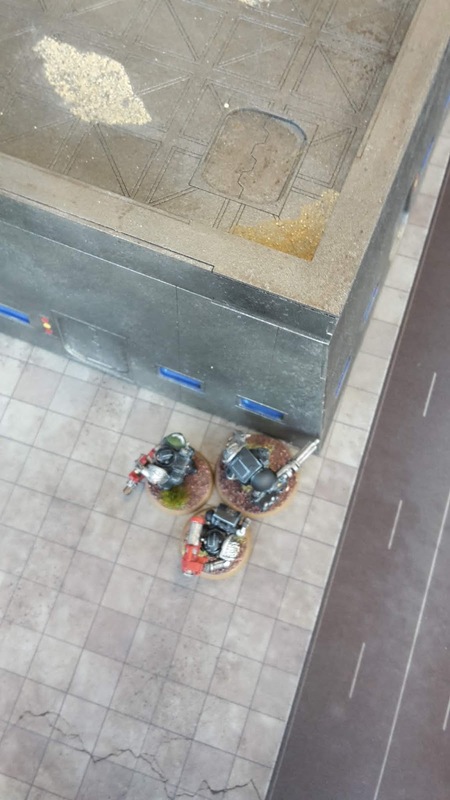 The Heavy Bolter Kill Team used the Teleport Homer to move to the left flank, behind the ruins. With little on the board, my Missile Launcher Kill Team fired at the Castellan, doing a single wound that was saved. At the end of turn 2, things were pretty much going as expected. Half my army was gone and I hadn't done a single wound on the Knights at this point. The Knights continued their advance on the Deathwatch. The Paladin fired at the Heavy Bolter Kill Team, destroying the unit. The Castellan fired at the last Rhino, destroying it with ease and killing one of the passengers. The Frag Cannon Kill Team moved up on the Castellan, I then brought in my reserves on the left flank to target the Castellan. 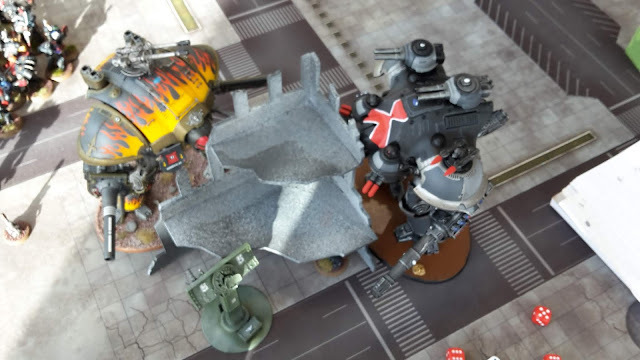 In the shooting phase, the Storm Bolter Kill Team used the +1 to wound stratagem and the Decapitation Protocol stratagem to target the Knight Castellan. 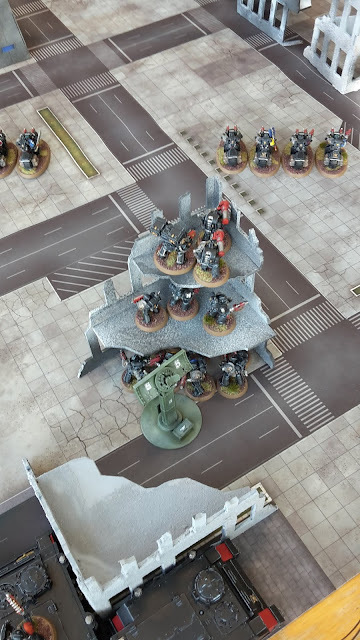 This game them 37 Bolter shots that were re-rolling to hit (thanks to the Watch Master), wounding on a 5+ with re-rolls to wound. Adam kindly agreed not to use the rotate Ion Shields stratagem to give me a chance to kill off a Knight. He had the game anyway, so there was little harm. The Storm Bolters managed to do a fantastic 24 wounds on the Castellan, thanks to re-rolls. Fourteen went through the invulnerable save. 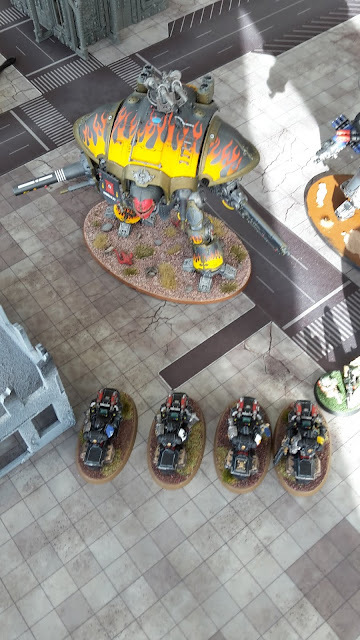 The Meltagun Kill Team added their firepower against the Knight Castellan. I managed to hit and wound, with two of the shots getting through the invulnerable save. I then rolled a double 1 for the damage! 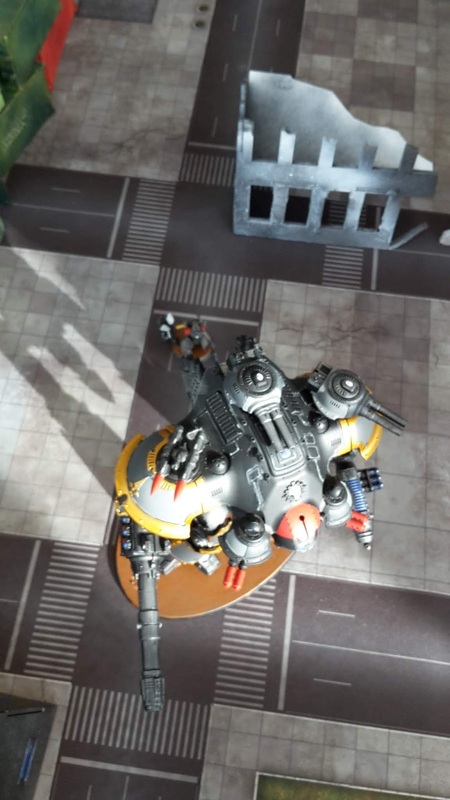 I used both re-rolls (CP re-roll and warlord's re-roll) to do 8 wounds on the damaged Knight. 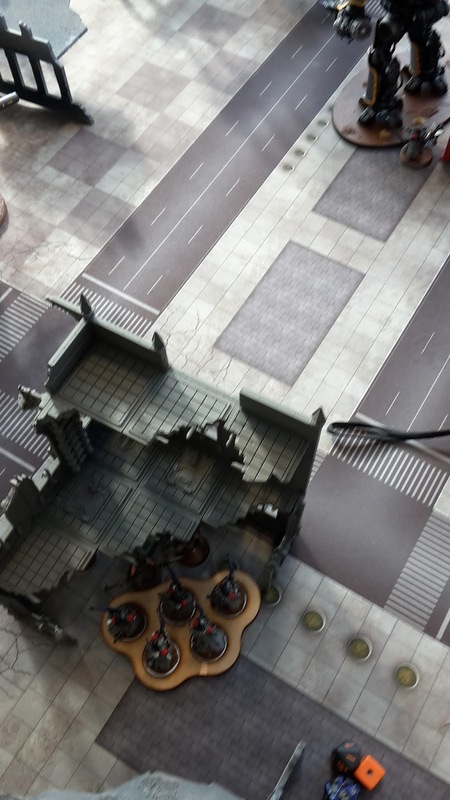 The Bolters of the squad managed to do 3 wounds, but all were saved. 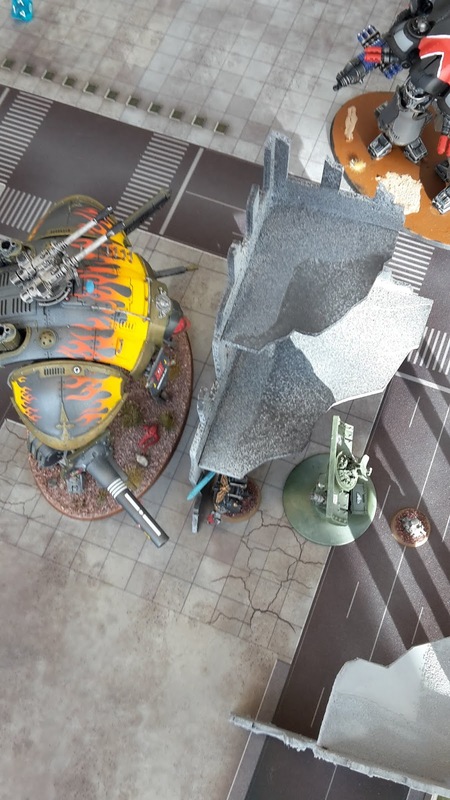 The two Missile Launcher Veterans fired at him, doing 11 wounds with their Krak Missiles and destroying it. Adam spent 2CP on making the Knight explode on a 4+. It exploded, but only managed to kill the nearby Enginseer in the resulting explosion. At the end of my third turn, some luck and the kindness of my opponent had seen one of the Knights fall. I was now braced for the retribution of the surviving Knights. 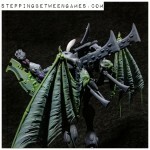 On the left, the two Knights moved up on the Deathwatch reinforcements. 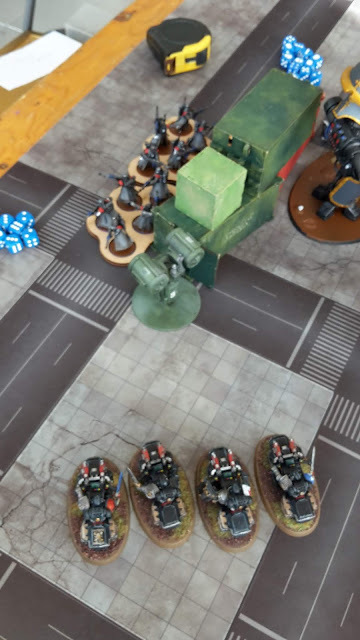 The Primaris Psyker cast Psychic Maelstrom on the Storm Bolter Veterans, causing four mortal wounds in total with the attack. The Knights split fire between the Veterans. 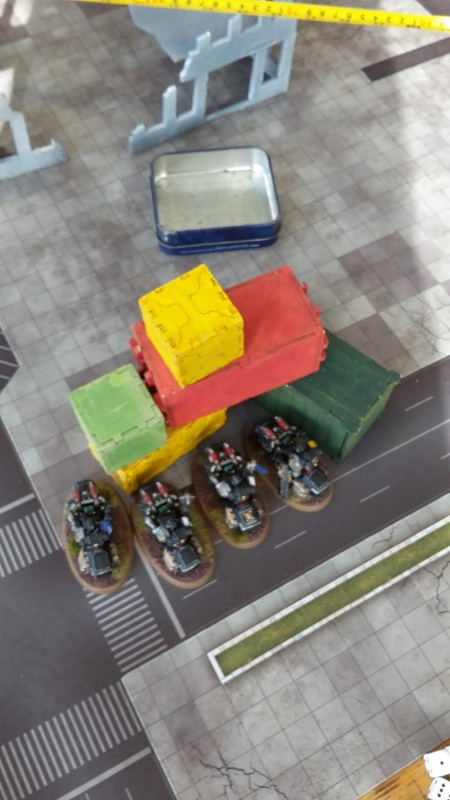 One Missile Launcher Veteran was slain by the Heavy Stubbers. 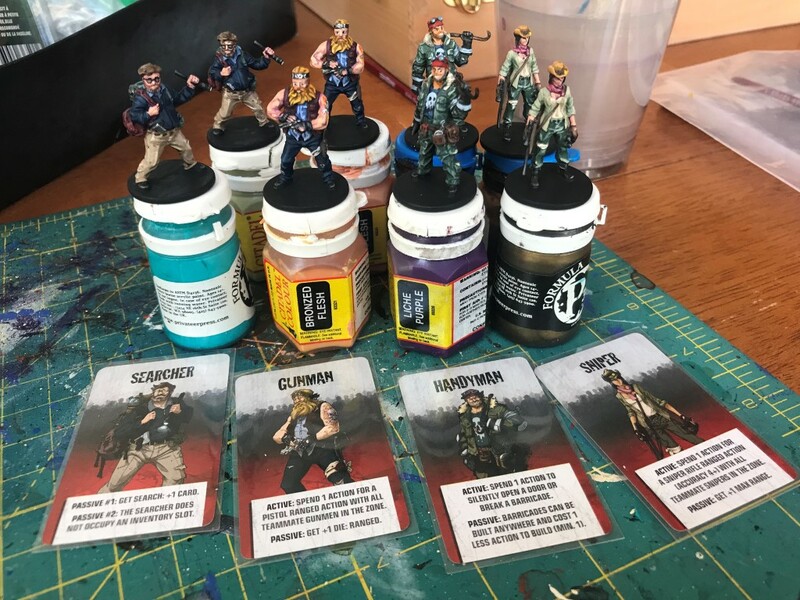 Four Storm Bolter Veterans and three of the Shotgun Veterans fell to the rest of the firepower. Adam then spent 3CP on the Oathbreaker Missiles stratagem and fired at the Thunder Hammer Captain. The missile hit and wounded, destroying the Captain in one shot. The rest of the Castellan's firepower finished of the Frag Cannon Kill Team and 7 of the Meltagun Veterans. I passed my morale tests, despite huge casualties in both units. 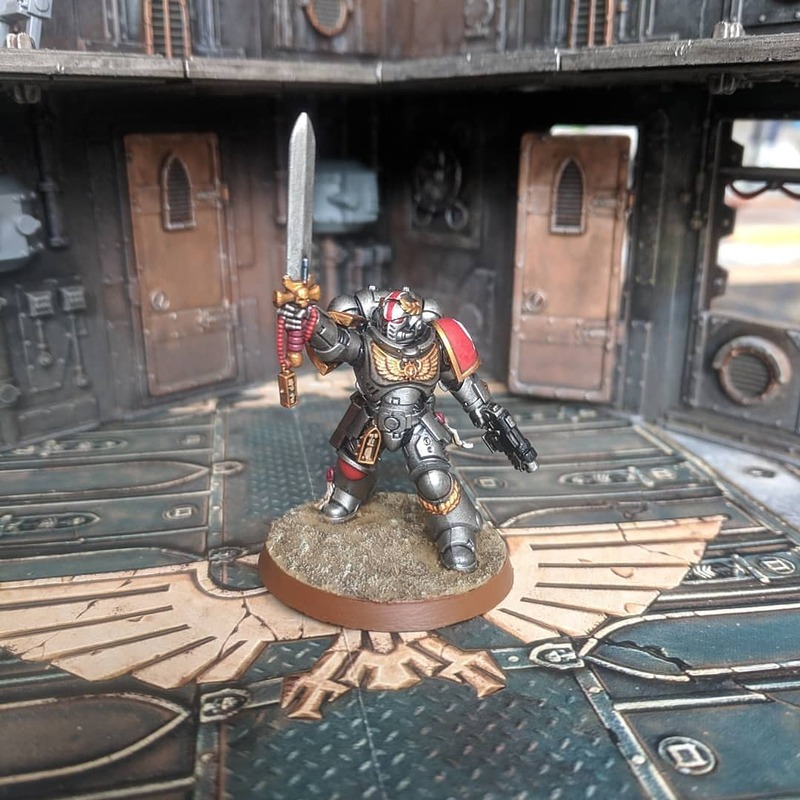 The remnants of the Storm Bolter Kill Team moved up on the Primaris Psykers, while the Meltagun Marines moved up on the two Knights. 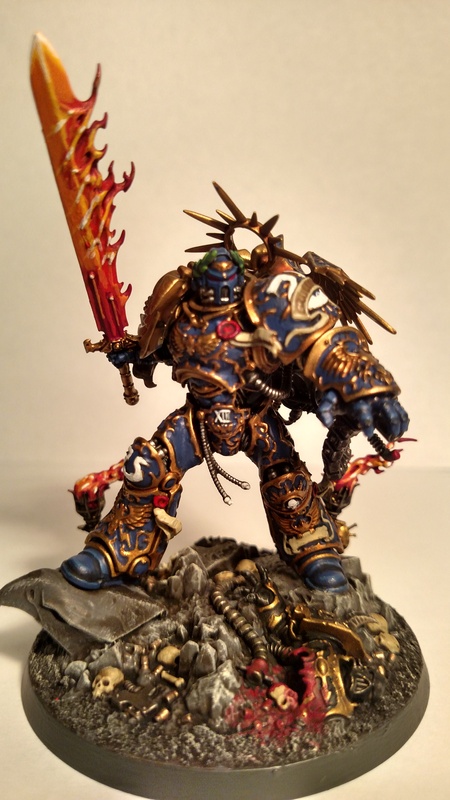 One unit of Intercessors broke cover to support them. 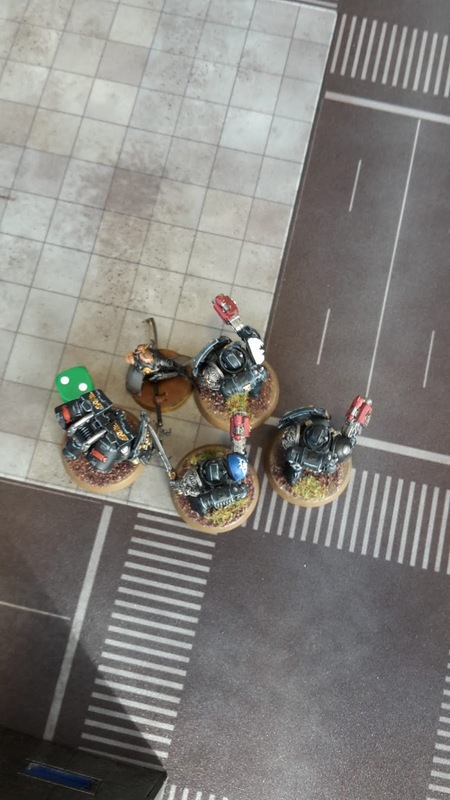 The Meltagun Veterans fired at the Castellan, who chose to Rotate the Ion Shields. Two of the Meltaguns wounded, one getting through the save to do three damage. The Intercessors fired at the Castellan, doing two wounds. 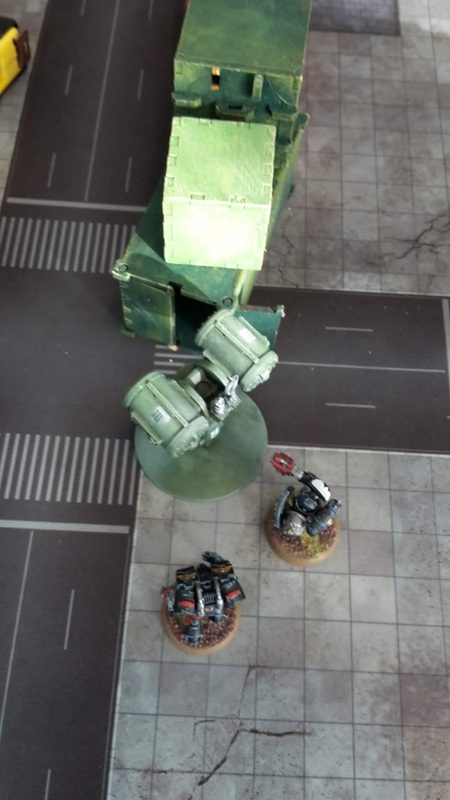 The last Missile Launcher Veteran managed to do another 2 wounds. The Storm Bolter Veterans fired at the Vanguard, killing three, while the Vanguard Veteran threw a Krak grenade at the Psyker, doing two wounds. 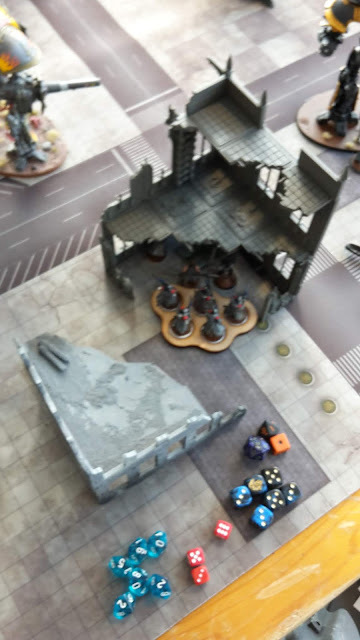 In the charge phase, the Storm Bolter Veterans assaulted the Primaris Psyker, killing him in combat. The Knights moved up on the remaining Deathwatch. 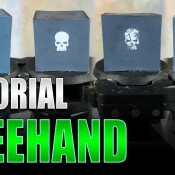 The Castellan used the Oathbreaker Missile stratagem on the warlord Watch Captain. The shot hit and wounded doing 4 damage. Adam used a CP re-roll, but got another 4, leaving my warlord on one wound. The Plasma Incinerator got 12 shots once more, killing the Intercesssors, the rest of its weapons killing of the Meltagun Veterans. 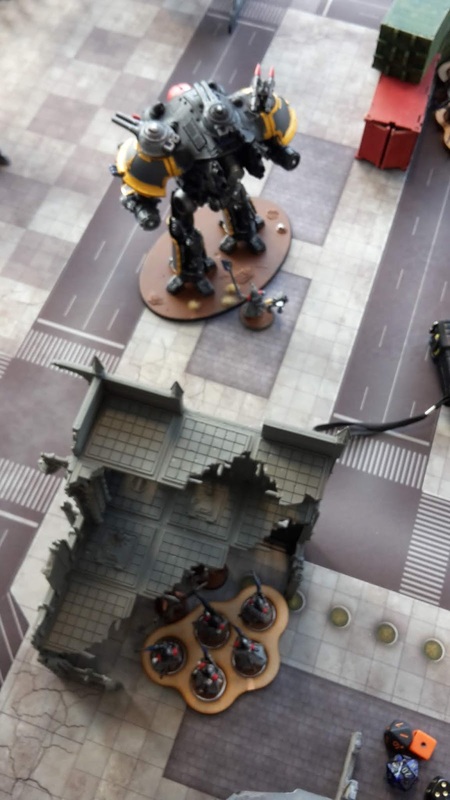 The Paladin fired at the Deathwatch. 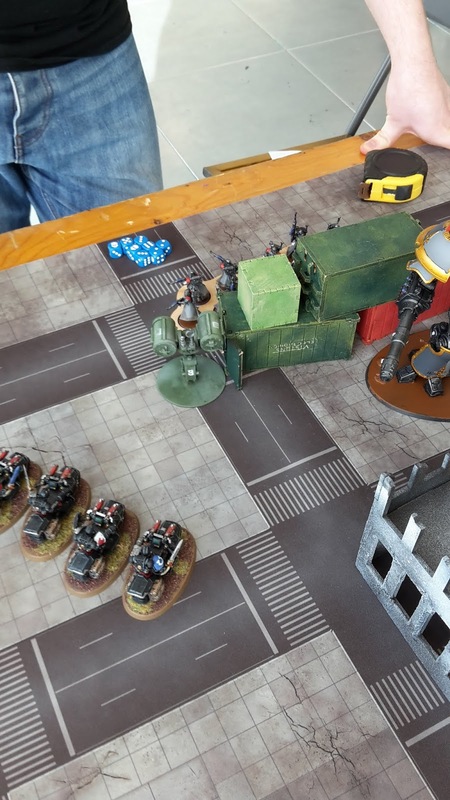 The Heavy Stubbers took down the last of the Missile Launcher Kill Team, while one of the Storm Bolter Veterans fell to the battle cannon. The Paladin charged the Watch Master, doing 8 wounds and killing the Deathwatch character. 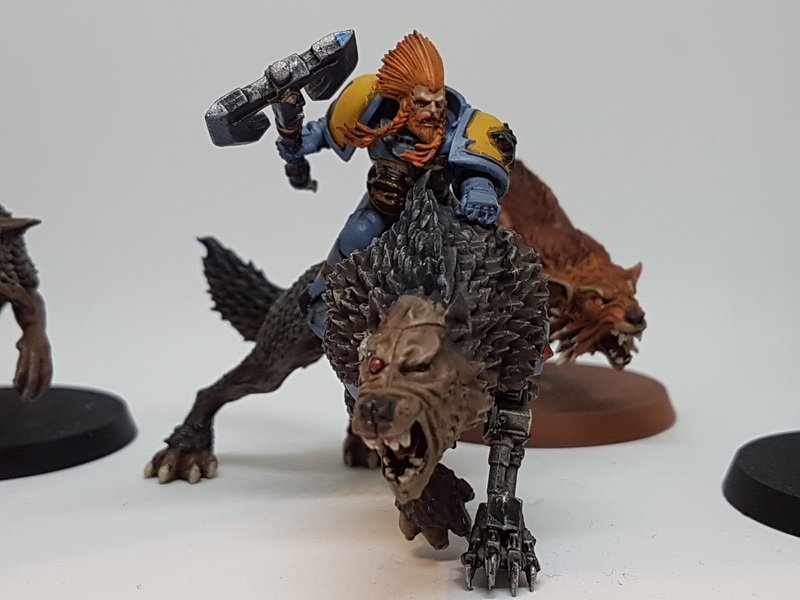 The Storm Bolter Veterans moved up on the remaining Vanguard. In the shooting phase, they fired a the Skitarri Vangaurd, killing them. At the end of turn 5, we both held 2 objectives. If the game ended here, I could pull a narrow loss, as we both had First Strike and Adam would get Linebreaker. However, the game did go on and we went on to turn 6. The two Knights made it to the ruins in my backfield. The Castellan fired at the Storm Bolter Kill Team, wiping them out. He also killed the Watch Captain in the ruins. 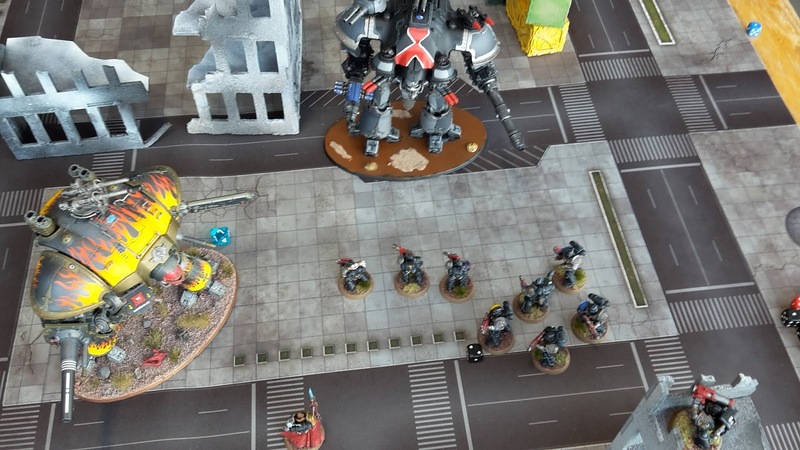 In the charge phase, both Knights charged the last squad of Intercessors in the ruins. 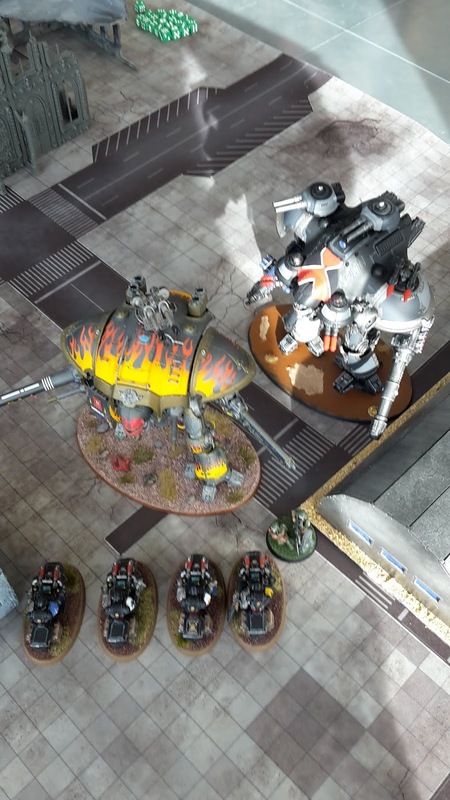 Both Knights were able to wipe out the unit with ease and the game ended with a tabling. 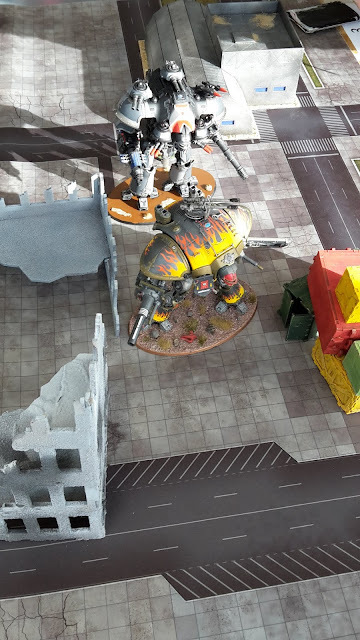 A win for the Imperial Knights. Well, that pretty much went as expected. In fairness to Adam, it was a lot more fun than I was expecting it to be, mostly thanks to his good will than any tactical skills on my part. 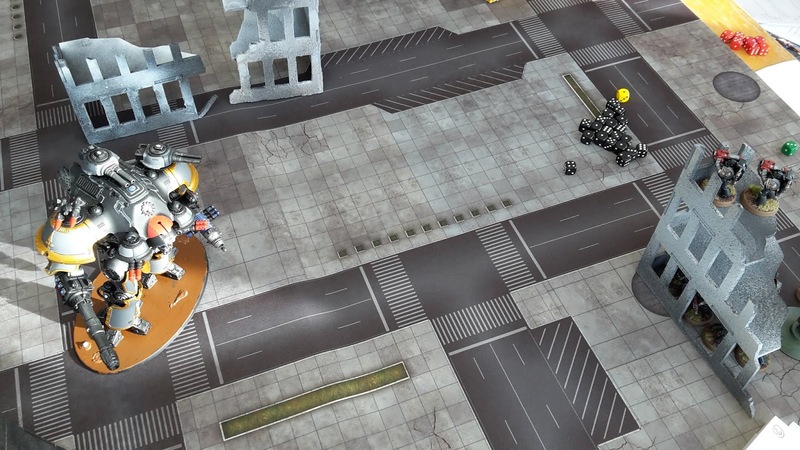 Adam decided not to use the Rotate Ion Shields stratagem on the Castellan on turn 3 to give me a chance of taking it out, otherwise it would have a 3+ invulnerable save. 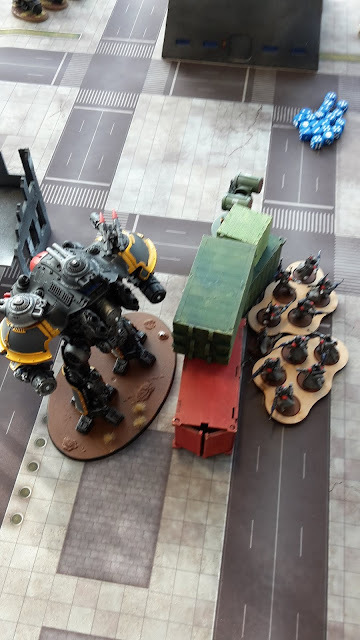 He also decided that he was only going to target my Missile Launcher kill team with his Heavy Stubbers for fun. He was able to wipe them out over several turns, but they should have died long ago if he was using the full capacity of the Knights. As it was, I don't think I ever really stood a chance in this game. 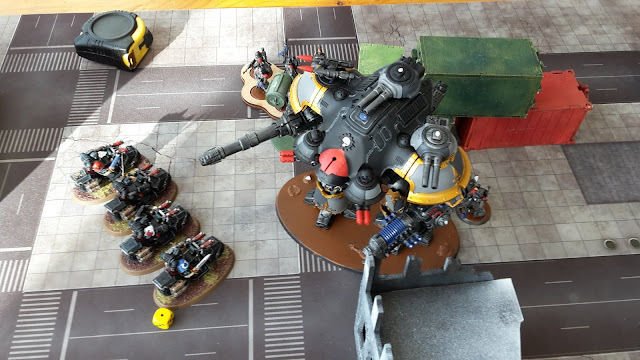 Knights are one army my Deathwatch struggle to deal with and I knew I would have a big problem if I faced them in the tournament. As it was, I was able to take out one in the shooting phase. However, I don't think even this should have happened. The Decimation Protocol only works against the enemy Warlord. It wasn't until writing this report that I realised the Castellan was not the army warlord, the Company Commander was. I should have been able to re-roll to wound with the Storm Bolter Veterans against the Castellan. As a result, I would have done a lot fewer than the impressive 24 wounds that the Storm Bolter Marines were able to pull off. 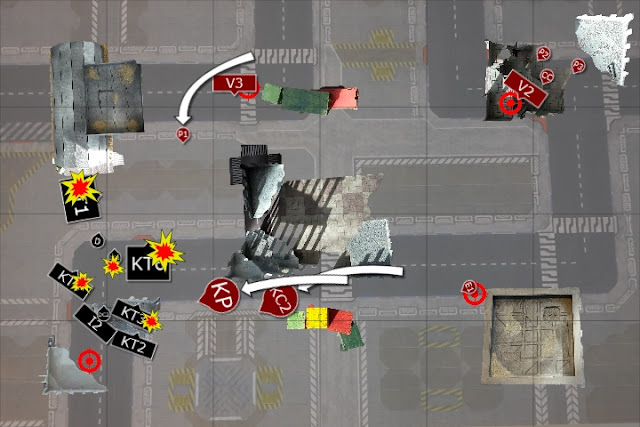 The deployment type also didn't help me in this game. I think Dawn of War would have given me more line of sight blocking terrain to take advantage of, perhaps allowing me to keep parts of my army safer for longer. 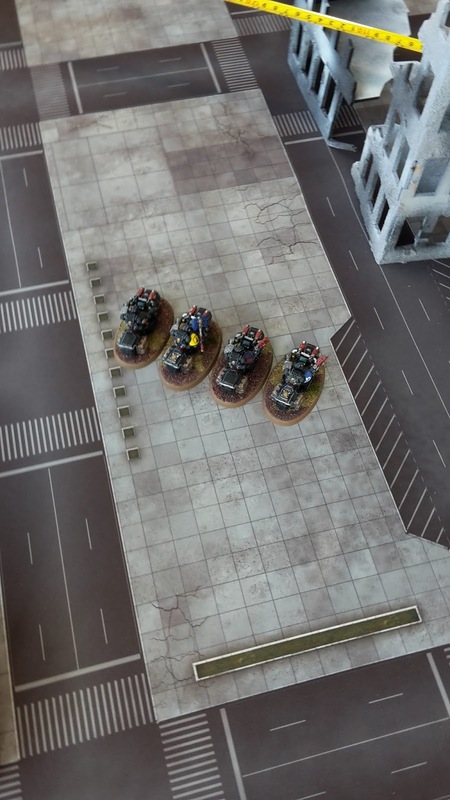 It might also have allowed me to go after Adam's objective in his deployment zone with my reserves, using the large buildings to hide my Bikers and allow them to go after the enemy forces in later turns. With one win and one loss, I was hoping for a better match up with my final game of the tournament to have a fun third game. Knights are really hard to play against and even in friendly games I have struggled. A lot of tournament reports I see\read seem to be dominated by knight heavy armies, I'm just glad my tournament days occured before knights were a thing. Yeah, if you are not prepared to take on Knights, you are going to have a bad time at tournaments. It wouldn't really have made a difference here, but I wish they'd update this scenario so that LoW (or at least those with the Vehicle and/or Titanic Keywords) give up bonus points as well as Heavy Support. 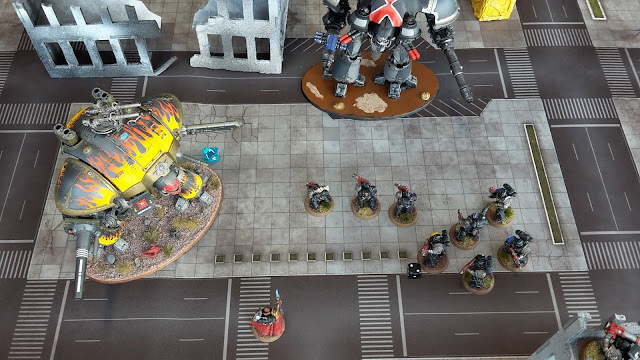 The fact that you can get a bonus point for taking out a Mortar Squad, but not for dropping a Castellan, is frankly idiotic in a mission that's supposed to be all about hitting the Big Guns. It would be nice to see some sort of bonus for taking out these monsters, rather than just a single kill point or bonus point in many scenarios.